Operating Era: 1922-1970. THIS SERIES NOW COMES WITH OUR NEW ONE-PIECE ROOF FRAME. Southern Rwy., Mobile & Ohio, Monon (Chicago, Indiana & Louisville), Atlantic & Danville. After WWI Southern began a program of installing as many inexpensive cars as possible on the road. Between 1922 and 1928 it purchased 17,171 cars for itself and M&O which it controlled at the time. The evolving design saw 4 different ends used over that span. First was a Hutchins panel end with tapered panels. This was followed by recangular panel Hutchins. In 1924 a strange T-shaped end was used. In 1928 Murphy ends were used, the only known use with truss rod cars. One 1922 installation had radial roofs; all others had peaked. When the cars were resheathed in the 1930`s the bands at the bottom of the sides was removed. Southern lettering changed completely between these periods. In 1949 Southern gave Atlantic & Danville 100 cars; some of each type were included. All roads` cars lasted into the mid-1950`s. We offer every peaked roof version known to exist - every end both as delivered and rebuilt with lettering covering the life of each type. 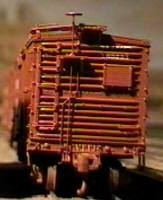 PLEASE SEE OUR MOW & CABOOSE SECTION FOR OTHER #4100 SERIES KITS. 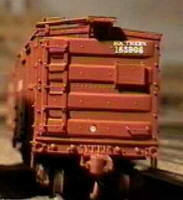 Please also see our ONE-PIECE ROOF SECTION for the #4140 one-piece roof frame separately.